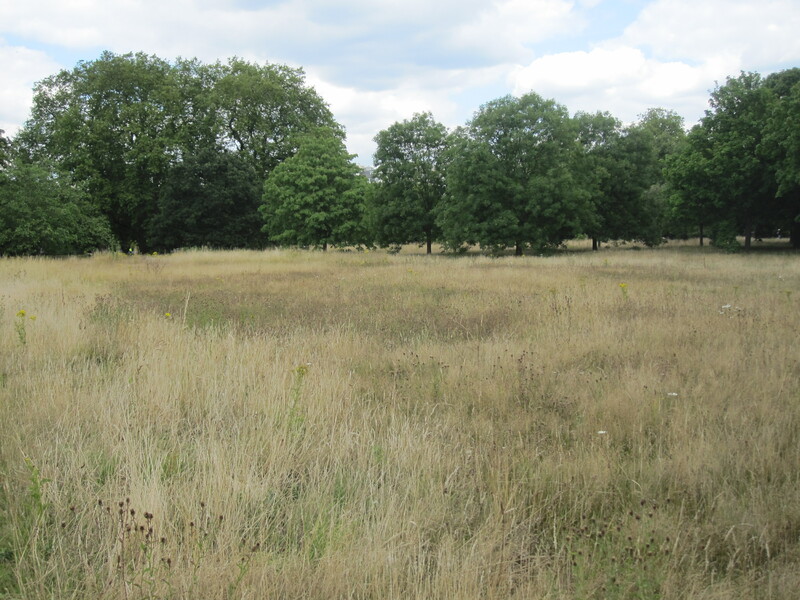 My annual summer ritual to stave off death for one more year involves running round Kensington Gardens and Hyde Park, which are situated conveniently close to $WORK. I lumbered merry as a shroud. 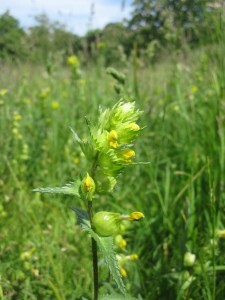 Yellow rattle is a member of the broomrape family, which are almost all parasites of other plants. 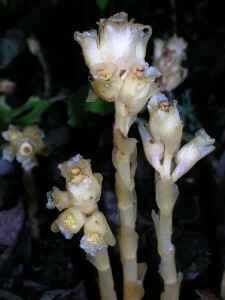 Broomrape itself is completely parasitic, and obtains all the sugars and other nutrients it needs to grow from other plants. This is why it has no need for the green pigment chlorophyll, which most plants use to capture sunlight. Yellow rattle, as you can see from the image below, has normal-looking green leaves, so it must be making at least some of its own food. So how do we know it’s a parasite? If you very carefully dig up yellow rattle roots, you’ll find they grow tightly around the roots of grasses and other nearby plants, and make physical connections with them. The rattle uses these connections to tap into the roots of other plants and to steal their water and nutrients. It’d be nice to show you this, but whenever I’m near these plants I am a sweaty, exhausted mess and it’s all I can do to take a photo, let alone go digging. 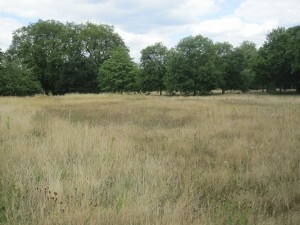 Also, as it’s a Royal Park, digging up rattle is probably treason or some similar nonsense. You’ll have to make do with circumstantial evidence instead. 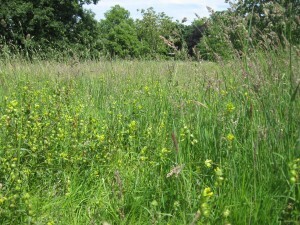 The big bald patch in the image below is where the rattle is growing. 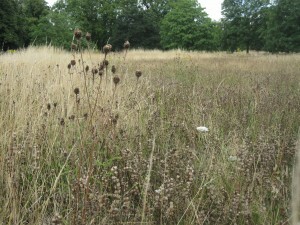 The grass is about half the height of the grass surrounding the infested patch, and much sparser. It’s the capsules that give the rattle its name: they make a satisfying noise when gently jiggled. 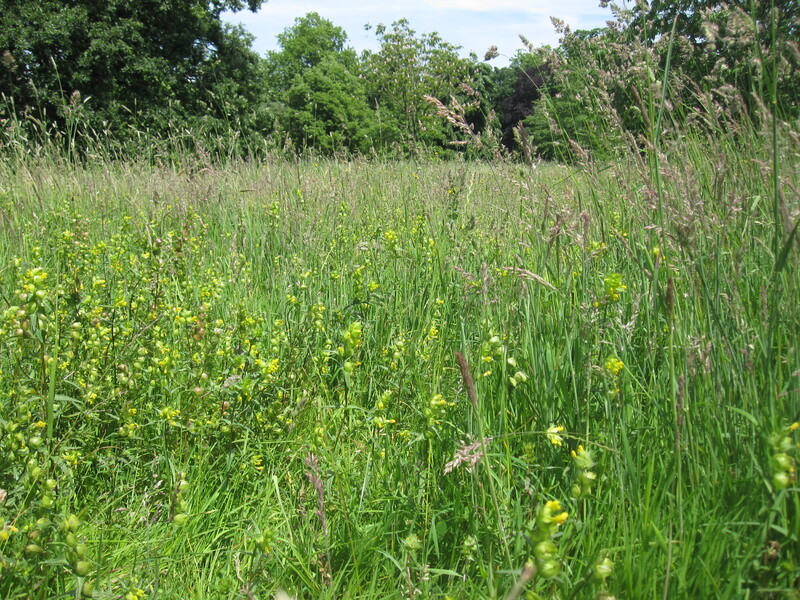 Although the rattle does damage the grass, it has a positive effect overall on the biodiversity of the field by keeping the grasses in check. As yellow rattle allows other species to grow that would normally get shaded out, it makes for a useful addition to those wildflower meadows that are nearly as beloved of the chattering classes as is the middle-aged PE of running round parks. Apologies to William Wordsworth, and poetry more generally.